The last time boxing fans saw Tyson Fury in the ring as a competitor he was singing (poorly) Aerosmith’s ballad “I Don’t Want to Miss a Thing” to his blushing wife. Moments earlier he had lifted the lineal heavyweight title from long-time champion Wladimir Klitschko. An immediate rematch was supposed to follow, but it never happened. In 2016, Fury publicly battled with mental health issues. Earlier this year, he announced his retirement from the sport. Only about a week ago, he claimed he had no plans to re-establish his license. But on Thursday, Fury tweeted that he will be ready to fight again in April 2018, and that he plans to fight three times total during the year. It is always hard to take what Fury says at face value. But if he is serious about returning, there are major fights out there for him to make. At the top of that list would be a clash with fellow Brit Anthony Joshua. With Fury in retirement, Joshua has become the top star in the division, by virtue of knocking out Klitschko earlier this year. But do not expect Fury to face Joshua in his first fight back. A better bet might be Dillian Whyte, another English heavyweight with top-10 standing. Whyte was stopped by Joshua in December 2015. While Fury would dwarf him, Whyte is still a large, sturdy fighter who has the size to stand up to a giant. Tony Bellew has forced himself into the heavyweight rankings after knocking out David Haye this year. The former cruiserweight would likely be overmatched against Fury, but it is another bout that could gain a lot of attention in the United Kingdom. 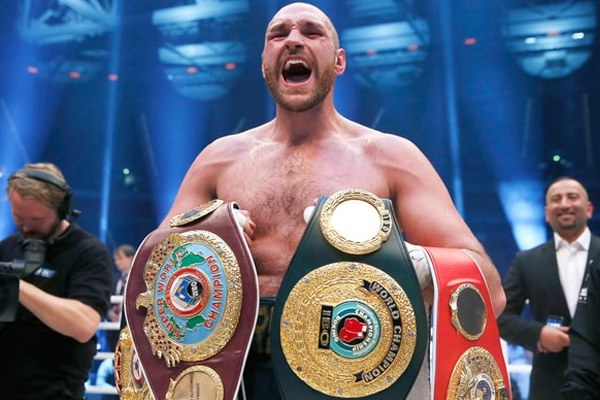 After nearly two years without a fight, Fury has essentially lost his standing as the true heavyweight champion. But his return would certainly make a surging division that much more exciting.